You must do passing drills and never assume your players are good passers. Poor passing will destroy an offense faster than anything. Excellent, crisp passing makes it all work. Many turnovers are related to bad passing or receiving. All players must become good at the chest pass, bounce pass and overhead pass, and at catching the ball. This passing drill emphasizes passing and catching on the move. See the diagram below. There are 5 lines (as there are 5 points of a star). The order of the passing is as follows: line O1 passes to line O5. Line O5 passes to line O3. Line O3 then passes to line O2. Line O2 passes to line O4. Line O4 passes to line O1 and the sequence starts over. The passer makes a good, sharp, accurate chest pass, and then follows the pass to the line that he/she just passed to. Receivers move toward the ball. From Coach Kevin McGeehan's DVD "Open Practice: Individual Drills & Team Drills". This full court drill emphasizes passing, the speed dribble and lay-up against pressure, defensive hustle, and conditioning. Use three lines (diagram A). O1 throws the ball off the backboard, gets the rebound and outlets to either wing. 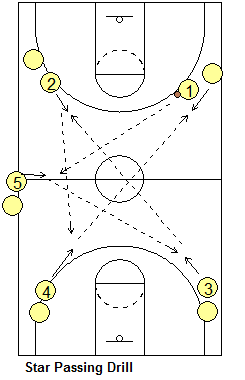 Each player sprints up the floor, staying in his/her lane. After passing to a wing, the wing passes back to O1 and then O1 passes off to the opposite wing, and so it goes. Once the ball crosses half court, the wing who received it across half court speed dribbles in for the lay-up. Meanwhile the opposite wing becomes a defender and sprints to the hoop to either challenge the lay-up or take the charge. O1 rebounds and starts the drill back up the floor. 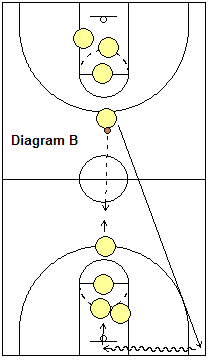 Make two lines on one end of the court as shown in diagram B, with the left line players (along the lane line) each having a ball. 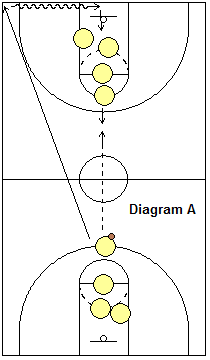 The first player (player A) in left line speed dribbles up to the three-point line and passes to player B sprinting up the side line, who catches the ball, speed dribbles to the half-court line and passes back to player A, who dribbles to the top of the circle, passes back to player B cutting to the hoop for the lay-up. Player A gets the rebound and drill repeats going back up the opposite side-line. The second players in line start off once the previous twosome has reached half-court. You can vary this by requiring a jump stop before each pass and after each reception. Use two lines (diagram A below)... one on each end with the first player near the 3-point arc. The player with the ball starts the drill by passing to the first player in the opposite line. The receiver should come toward and meet the ball. The passer sprints to the opposite corner and then slides (defensive slides) to the hoop, and then enters the opposite line. Diagram B shows the same thing as the initial receiver now is the passer, and then sprints to the opposite corner and slides to the middle. The drill is continuous from here. Make sure players are not only making good passes, but are sprinting and getting their butts down doing good defensive slides.